Bristol-based artist Philippa Lawrence is best known for her recent tree-wrapping project (Bound). Philippa approached papergecko to commission a simple but effective website to document and promote her practice. 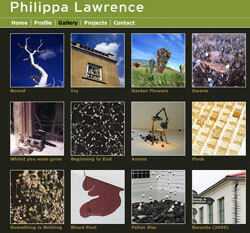 The site features image and project galleries, plus a feature which keeps the home page fresh by selecting a random image from a bank of images of Philippa’s work. Papergecko are also responsible for updating the site when required.